Last month, over 200 people packed a State House hearing to testify on several bills that would put a moratorium on the use of standardized tests as graduation requirements and for school accountability, as well as to prevent the adoption of the Common Core-aligned PARCC assessment. The Board of Elementary and Secondary Education will conclude the public hearings on July 7, before deciding whether to replace MCAS with PARCC next fall. As a teacher in a high-needs school, I am always focused on providing my students with the tools they need to be ready for college and career. My fifth grade student Nia, who wants to be a surgeon, says that "my teacher pushes me to boundaries that I've never been able to cross before." The other students in my class have dreams of becoming movie directors, artists, athletes or teachers. The work that I do with my students each day using the Common Core State Standards has helped them develop strong critical and analytical thinking skills. As a result, my students have become more confident about achieving their long-term goals. With the PARCC assessment a major topic of conversation in education, I wanted to know what my students thought about it. I asked my fifth graders to write about the impact of testing on their learning, with a particular focus on the PARCC assessment. Eyshila, whose parents emigrated from Brazil, wrote, "I strongly believe that PARCC should be the only test because it makes our brains think and we need that." Sophie wrote, "When we did the PARCC, the text was very complex and made your mind think WOW. I think the people who made it really wanted us to think." And Terrell said that he favors the PARCC because "it is timed and that challenges students more." As I read through the comments, I realized anew the importance of listening to the group with the highest stake in education: my students. As a teacher, I find PARCC to be a better assessment; my students agreed. Perhaps it is time that all adults -- educators, parents, policy makers -- listen and do what our children are suggesting. We must have a reliable and rigorous tool to measure how students are performing academically across the Commonwealth of Massachusetts. This tool would be used to hold teachers accountable for the content they teach. And it we want educators to be successful at implementing this tool, school districts must take the time to provide meaningful professional development to teachers around the Common Core State Standards and the PARCC assessment. Although most of my students were in favor of the PARCC, there were others who opposed it or, indeed, any form of testing. Myaliyah, for example, did not find tests meaningful to her learning. She wrote, "The test I have been taking is way too much. If we are taking more tests than learning, how do you expect us to pass if we are not learning as much?" Research has shown that students in urban public school districts are often over-tested and struggle the most with high-stakes tests due to challenges with disabilities and/or language barriers. It is the responsibility of the state of Massachusetts Department of Education to provide these school districts with more time and resources to meet their students' needs. If we truly care about providing equitable access to public education for all children in the Commonwealth, we need to find better ways to invest in all public school children. The students in my classroom hail from countries such as Haiti, Jamaica, Puerto Rico, Brazil, the Dominican Republic, Barbados, Nigeria and America. Out of 21 students, 24 percent are of Latino descent and 76 percent are of African descent. Providing all these children with equitable educational opportunities and resources is a civil rights issue. If we are going to use the PARCC assessment, let's use it as a tool that measures which students or districts need the most support and provide them with resources wherever necessary. In addition, the data from the PARCC assessment should be available immediately so that teachers and school leaders can analyze it and use it to impact student teaching and learning. The future of our children is in our hands. It is urgent that all educational stakeholders in the state of Massachusetts put their differences aside and put our students at the forefront. 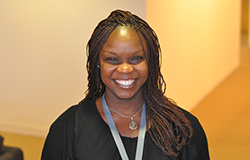 Bernadine Lormilus teaches fifth grade at the Channing Elementary School in Hyde Park, Massachusetts. She is a member of the NAACP and a Teach Plus Teaching Policy Fellow.